DD1 has been in this journey of learning without school since some time(read months) now. There have been related posts about the same. Today, I thought I could brief of how a day looks like in this journey of open learning (or learning without school). Though, there are quite some things that need be in place and is taking time, the journey so far has been good. In the morning, we watered the plants when DD1 tells me the names of each plant. Then bath. DD1 and DD2 get into some pretend play in the bathroom, scrubbing the bathroom floor, the walls and the glass. When they are done, they would call me and I am in no hurry. Time for breakfast, cooking, free play that involves pretend play as shopkeeper. They take turns in the play. Next was story time, where DD1 picks a book and we read (She tries). Sometimes, DD2 also picks up a book for herself, then, it follows by a small fight/cry over which story we should read first. After some talk and negotiations, we start reading one. DD1 just loves playing this game. She can move her pointer fast, she knows what number she wants in order to land in a favourable position on the path, she knows how fast she has to travel in order to collect the money placed on a particular square, she knows some subtractions/additions during the bank transactions that happen in the game, she even pretends to drive the car while moving her pointer. DD2 woke up and we hurriedly packed this game up. DD1 got a board of CROSSWORD which had just two letter tokens N and T. DD1 asked me how the game is played. I pointed across some squares on the board saying, I would place C, A, T(I didn't have these tokens) here and I score the total number of points from the letters C, A and T. For which she took the only tokens present there N, T and said she would make NET with it. She placed the tokens N and T with a gap in between and counted her score. Next is, some time for hugs and cuddles. The most important of all. Then, DD1 and DD2 set out to play another pretend play. 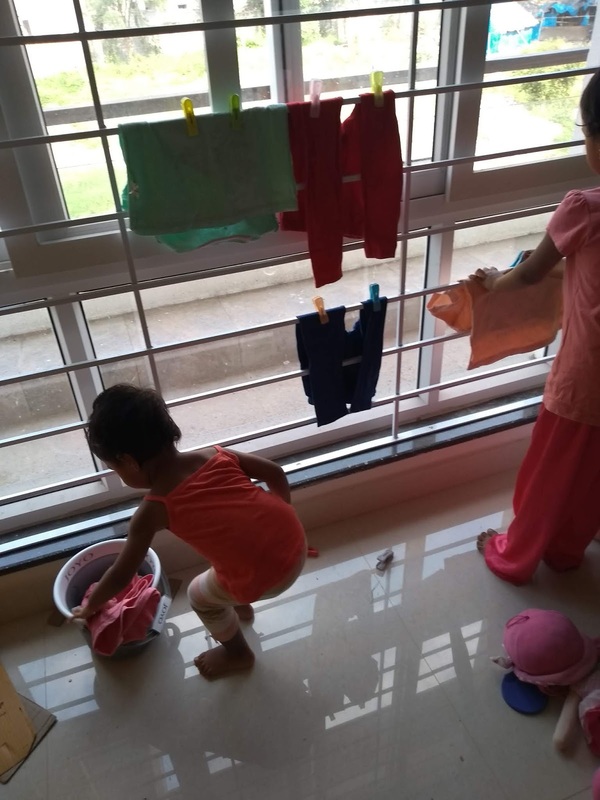 Both of them collected some of their clothes - shirts, pants, undies, took a bucket each, went upstairs to get some cloth pegs, placed a stool at a certain place which they called a washing machine. Put their clothes in the machine. 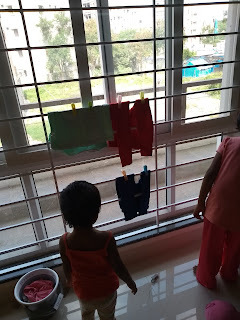 Make some sounds as if the machine started to run, after a while, make sound indicating that machine has stopped, take out the clothes, hang them on the rods secured with cloth pegs. 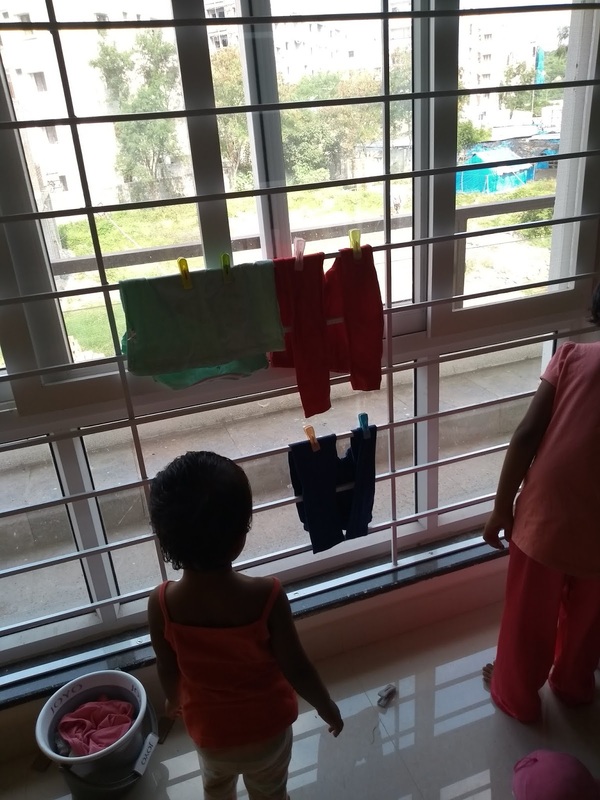 After some time, the clothes are dried up, go back into buckets and then washing machine from there and the game REPEATS. DD2 was trying to balance herself by holding a shirt on the rod, bend over to take a peg, she couldn't reach, so she left the hand with which she held the shirt to reach the peg, then the shirt fell down. Next, she placed the shirt evenly across the rod, it didn't fall and then she bent down to reach a peg. So much of thinking goes into what kids do !!! The action might not be important for an adult's eye, but, it is the thinking, the thought process involved that makes a world of difference to the child. After good amount of play, we move on to snacks/fruits/milk. Very soon after that, they again took to pretend play where one was making juice with an apple and another was making soup with alphabets. After another good amount of play, DD1 gets reminded of gulab jamun which we have been procrastinating since many days. Every time she reminds, it was not a convenient time to make, and, hence, got delayed. Today, she said, we had to make. She reached the gulab jamun packet. Added sugar to water while counting the number of spoons she was adding. I put it on stove. She started to mix the dough. After some time, I took over to make the dough mix and then both of us rolled balls out of it. DD2 joined as well. Next, I had to deep fry the dough balls in oil. Now, DD1 and DD2 are safely and conveniently seated on the kitchen platform. They eye a small manual grinder that is used for making pickles. 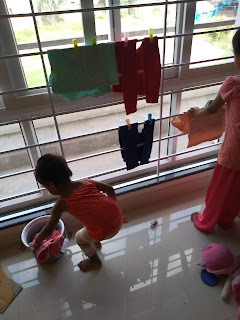 This leads to another play where each one takes turns to grind and the other adds matchsticks, salt, urad dal, drops of oil, bits of dough and tell me that they are also preparing an item while I prepare the gulab jamun. They called the item 'noodles'. Gulab Jamun is now complete and is soaking in the sugar syrup. Few walks here and there and they got their jamuns to eat. Then they went out to play. Some time on the road, some time in the car, pretend driving. Then it is dinner time. Some time for free play. Next, sleep time. That is how a wonderful day ends. 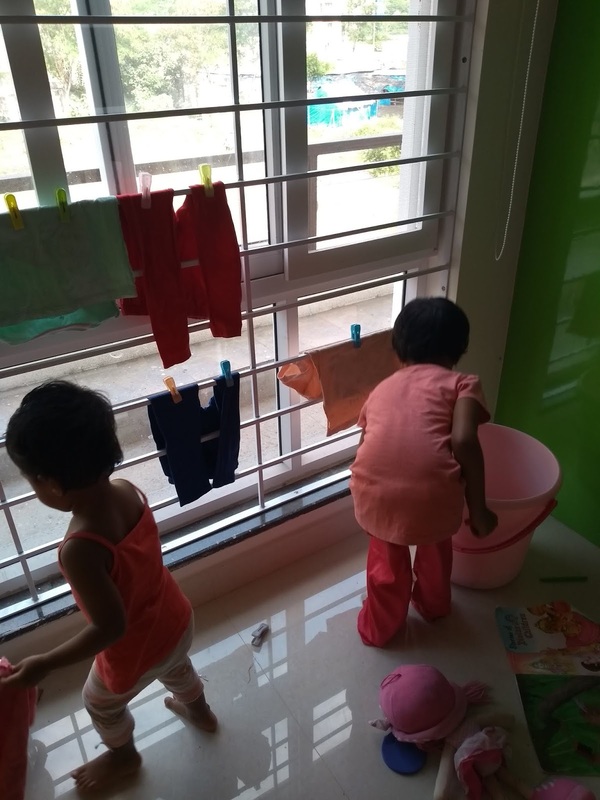 Yes, there were cries/tantrums today, there were arguments,fights between the sisters too. Mostly because one does not understand or communicate in the same way as the other does. There is learning in these too. Children learn from anything and everything. So many learnings in a single day.. I should say, I am learning as well.